the news seeping into my little world isn’t so swell these days. nothin’ at all to do with today being that unlucky friday. phooey, i say to that. that’s ol’ superstition. and superstitious i’m not. not so much, anyway. i’m talking about the front page of the paper. and, lately, the business page, too. they’re the ones spelling out the downs and the more downs; whole columns of type, sprinkled with words like recession, inflation, and war that won’t end. oh, and bosses at work being shown to the door. and other ones, new ones, saying they don’t like what we do. and we don’t do enough. and, oh, by the way, they’re cutting the pages, and the numbers of people paid to fill the ones left. all sorts of talk, all day in the newsroom, about what’s going to happen, and who’s going to leave. anyone left, we all wonder, still reading the news? anyone left who loves turning a page, not knowing just where your fancy might land, soaking up something wholly brand new you might never have known? getting grabbed by a photo, or maybe a headline. seeing a byline, sinking into the words of a friend you’ve not ever met but feel that you’ve known for ever and ever. it’s all very shaky. and it’s not only newspapers. here in the village where i now mostly walk, or pedal my bike, to save the gas in my tank, i see houses for sale. hear stories of folks needing to move. i know my dear friend the breadman isn’t baking so much. because no one is buying quite so much anymore. and cash registers, all over town, seem to be rigged with an odd little button that makes all of the totals twice what they were. even at home, there are reasons to worry. the tall one is stiff, with a pain in his back. and all of us grownups, on pins and on needles. so what do i do when it’s shaky all over, when the world at my door gets blurry and buzzes and is all out of sorts? i crank up the dial on the parts of my life that matter the most. i pay attention to what i’m cooking for dinner. i set the table with just a little more care. i cut more and more peonies from out in the garden. i tuck them there by the bedside, even in rooms strewn with little boy’s clothes. i walk to the library. i sit with my sweet little starting-out reader. we pluck books, chapter books now, from shelf after shelf, whole piles too heavy for one of us only. we take turns with each chapter. we take turns with the book bag. sometimes, each one of us takes one of the handles. we lug it together. i buy pie for no reason. i promise to learn to make my own crust. i snip herbs from the garden, snip with abandon. it’s summertime now and i needn’t be stingy. i work in the garden. i pull weeds and more weeds. i stand back and admire the one-inch-by-one-inch that‘s finally weedless. i sit on the stoop. i let ice melt on my tongue. we stuff chocolate-chip cones with mint-chocolate ice cream. then, for no reason, really, except for the joy of redundance, we sprinkle jimmies on top, those bit-lets of bite-able sugar. then we try not to bite, but only to lick. not once have we made it, not once without biting. these are the games that we play when we play for no reason, ’cept for the pure joy of playing at play. as the world around me feels all very shaky, i sink deeper and deeper into what i love most, on a scale that gets smaller and closer to home, closer to heart. it’s almost, you might want to think, like whistling in the dark. only that’s not what it is if you look from the soul side. it’s whistling, all right, but with very deep roots. it’s the whistling of grownups old enough and wise enough, and humble enough, to know that the whole of the world we most likely can’t change. but we can keep the ones that we love from feeling the bumps and the worries, from noticing that all around the edge of this boat, the waters are sloshing, are getting quite queazy. we can make this place we call home a fine and true respite. the place we come back to, because it soothes us and calms us. because in a thousand small ways, we can dust off the dirt, and polish the places that just might maybe shine. we might not steal headlines. we might not cinch deals. we might not be brokers of peace ’round the globe. but what we do with our days, and our hours and minutes, just might make the difference in just a few blessed lives. and those lives, some of them, were handed to us, for just a short time, really and truly. someone wiser and truer than i’ll ever be, someone infinite, someone you maybe call God whispered once upon a time, spoke to each of our hearts. said, this is my beloved, and this is yours, too. i’ve breathed in a life, i’ve sculpted with love. it’s your job, should you so choose, to cradle, to take by the hand, to teach the words and the poems and the stories. to tuck into bed with a prayer, to draw tight the sheets. to kiss sweet blessed heads, and send dreams off to dreamland. give the gift of your calm. give the gift of your grace. give laughter. give whimsy. give ice cream with sprinkles. make it be simple. make it be rich. and then that Someone reached out and gave us our loves. a wise friend of mine tallied the world as some of our children have lived it: 9/11, afghanistan, iraq, columbine. then there’s tsunami, new orleans under water, virginia tech, and gas at 4-plus-bucks-a-gallon. and, sure as heck, i’m leaving out a thing or two that’s kept you awake. now, in grade school and high school, even in pre-school, they practice drills year after year, in case of intruders. our cold-war atomic-bomb scares replaced with very real fears that a classmate, or passing-by kook, could burst through the door, carrying guns. some nights, as i lie in my bed, whispering prayers, and begging for mercy, i ask for a cloak of untattered peace to fall on my house. and then i wake up, and give it the whole of my heart: i crank up the oven, i tuck in a pan of cinnamon rolls. i wait for the sound of the feet that i know. the big ones and little ones. even the cat’s. and i do what i think i do best: with all of my might, i aim to sew even though i can’t thread a needle (not anymore anyway, not without my old-lady glasses). i stitch this old house with gracenotes of beauty, and fumble for even a loose knot of calm. i pay attention to nooks and to crannies no one might notice. i iron out wrinkles. i wring out the worries. it’s called housework. and mine is of and for the soul. i owe it, i do. 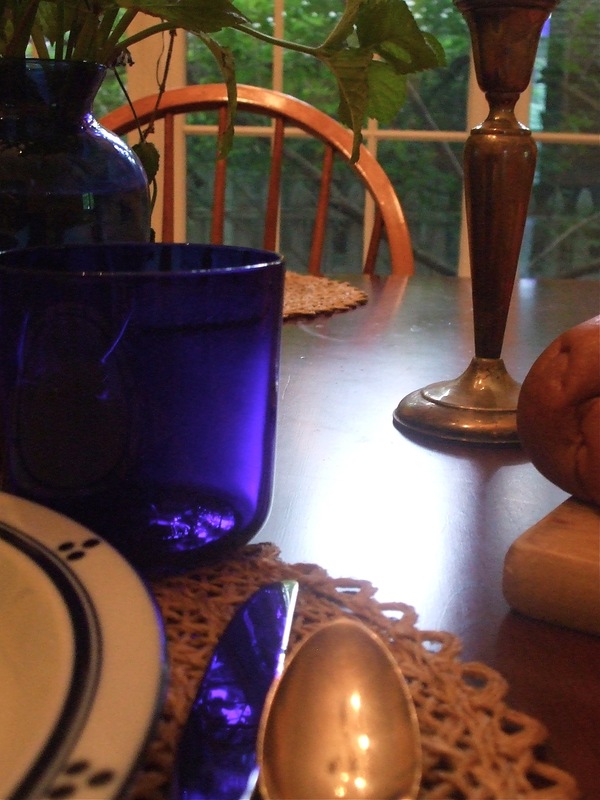 to the ones whose everyday stories are being inscribed at my old kitchen table. and besides, long long ago, i promised: dear God, bless me with life, and i’ll make it most noble. how do you make your world a little bit calmer, a little bit richer, when all around it feels like the walls are starting to crumble? There is much turmoil – local and global – and yet, I have never felt so hopeful. The formidable challenges we see at every turn are being faced by people who have become stirred into action and are engaging in democracy. People are coming out of their homes to vote – they are on the streets getting others to vote. They are looking and digging at “root causes” for these problems. So Many are hopeful. They are invested in what is happening in our world -not just their own life. Somehow, we have this amazing energy and investment of talent emerging to deal with a corporate world gone awry and calamities beset upon us by Mother Nature. Daily, I feel a very shaky reality and uncertainty. At the same time, I see the values and hope awakened in so many and I get giddy with excitement about what is ahead. Bless you bam for attending to the sacred moments. Those tiny units of time through which we enter life, and by which life is given to us…and which make up those bigger blocks of time that we fret about! Thank you MBW for the utter contagiousness of “giddy with excitement about what lies ahead” – such possibilities of hope to conjure! Shakey Friday indeed and our little neighborhood world was rocked on Friday as one of our own, a dad, with two teen boys, died around noon after a long illness. This was a dad that created a mini baseball field in his city backyard (pennents, lights, flags) so the kids could play. He cooked corned beef on St. Patrick’s Day and invited the neighborhood, held Derby Parties replete with a pony in the alley, and searched for the most realistic Santa outfit, so it would be easier for kids to believe. Indeed between the news in print, in the newsrooms, in the economy, in the world, well…. it is sometime hard to figure out where goodness and beauty exist. Yet, I am seeing much goodness this Father’s Day weekend as family, neighbors, and friends have been streaming in and out of my neighbor’s home with food, stories, and love. It is the small acts of love and generosity that powerfully counteract the less honorable acts that seem to drive corporations and the economy. A friend recently returned from Haiti where there is dire poverty and found that the poorest of poor people were rich in generosity and welcoming. It is the little stories that really give us hope…I wish the newspaper could put one front page story a day on all the little moments – Bam sort of stories. There was one today that helped get my day in perspective. I just keep watching people instead of TV…..I find much hope that way – and there is always PUAC 🙂 Happy Father’s Day to all you dads out there – may your lives be rich in stories and love this coming year. It’s funny how your last two posts have hit so close to home for me… They capture perfectly my yearning for those perfect, careless summer moments and the fear that creeps in at the edges of my day. I am afraid of all these downs, afraid of the future (my future, everything so new and unknown), and afraid that time is slipping by too fast this summer… Which is why I strive so hard to appreciate the little moments of bliss that do come my way. I try to treasure those moments, and go forth boldly knowing that there will be more good times even during the bad. Giving all of your heart can hurt, but what else grants us those noble moments? oh, dear lamcal, just read your lament for a fallen father, and ached right along with every word. my heart pierced soon as i got to the part about the backyard baseball diamond. (i feel like maybe last summer or once before you wrote about that…..) isn’t it striking how when death tiptoes into the neighborhood it shatters everything….just knowing there is a house in such grief always makes me feel as if i can see the black crepe hung in mourning. i can feel the weeping of the walls and sighing and moaning of the roof. even when i don’t really know and love the someone, as it sounds you certainly did love your someone. and God bless the rhythms and rites and rituals that have us streaming in with our stories and our casseroles, and our bundt cakes as my friend katie declares (births, deaths and moving vans, she insists, call for the bundt cake pan). i will hold them all in my prayers today……..and dear ivy, hullo, friend. speaking of holding each moment, sucking the marrow out of its bone, my sweet husband was reading the paper last night, when he turned and said to me, listen to this: he then read jessica lange’s words from a commencement address at i can’t remember where college. i’ve been mulling it ever since. it was about being in the now, catching the way the light slants through the window, soaking up the sound of the mockingbird, the way your child squeezes your hand. life is the accumulation of well-lived moments, she said. i am paraphrasing, but her point was what we keep trying to cling to here at the chair: find the sacred in every moment, and you are living as wholly and fully as you possibly can. sounds like lamcal’s neighbor knew that, lived that, and that’s why his passing is so piercing…….may we all step in to fill his big shoes. amen. “These are the times that try men’s souls.” This simple quotation from Founding Father Thomas Paine oh so long ago reminds us that challenging times will always be with us. But, what we do and how we respond to the times we live in is what truly matters.I’ve often said that when our tree is shaken, it’s a test of what fruit remains. In other words, what does our character say about us when we’re pressed and put to the strength and flexibility test. Is our foundation stable? Does the tap root of our tree reach down far enough to sustain us? Lately, my ‘tree’ has been beaten about by the winds of change, but I hope the rotten fruit fell away and only the sweetest of fruits has remained. bam, you’ve once again taken our collective pulse and, even though it’s pounding from stress, fatigue, worry, concern, and even fear, you’ve reminded us that our treasure must lie in the things that matter most … those that we love the most. We may not be able to change the entire world, but we can change our private world to reflect as much grace as we can afford. I’m provoked to do just that … thank you for your most gentle reminder. My hope is at the poles (as it will be at the polls in November)…sorry, couldn’t resist.Nothing new, just am struck as you all are by that laundry list that Barbie mentioned: Afghanistan, 9/11, gas prices, etc., and by strange values, unkindnesses, lack of courage I see around me.On the other hand, I see new growth and passion, too. I live in a community more insulated from some of our current aches because of its wealth. But it makes sense to me that when things go too far to one side, that there is an urge toward correction. And I see that happening, too, as some of you have outlined here.I was thinking about all this last night in a funny setting, you might say, for such thoughts. I was at The Swell Season concert, the duo were in the movie Once. Glen Hansard was a busker in Dublin, singing about love and life. And there he and Marketa Irglova were on the stage, having won an Academy Award, along with Glen’s Irish band, The Frames, but so thoughtful about nature and the environment and especially, the heart. They were humble and kind and honest and personally connected to the audience, and most of all, they acknowledge their own struggles. And the world loves them, can’t get enough of them. I was thinking it’s because there’s something about them that represents that correction for which we yearn. Chicago was a planned one-night stop on their tour and it sold out so fast that two more nights were added. I’ve never flown a flag but I’ve been thinking a lot, too, about the fact that we live in a country where such correction is possible. When Watergate was all over television until Nixon’s resignation in 1974, many people were tsk-ing the fact that it was such an embarrassment to publicize the details. My dear and departed stepfather used to say he disagreed. “We live in one of the few places where this could be aired and corrected. We are lucky.” I agree. wise one, you make me pause and ponder the correction: in our hearts, and the dailiness of our lives, and on the grander scale of a democracy, it is everything, isn’t it. not that we are flawless, oh no, but that we recognize and own our flaws, and then, as you so wisely remind, we correct. i know there must be some ancient native american wisdom on that note, and i wish i had it to pull out of my pocket right here, but i don’t know it, so i will leave with this, thank you for reminding me that to mend our ways, collectively and personally, is undying redemption. thanks for coming by. you always make us wiser.